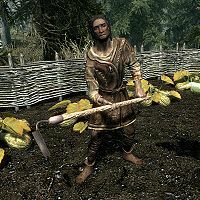 Mathies is a Nord farmer who runs Corpselight Farm in the city of Falkreath with his wife, Indara Caerellia. 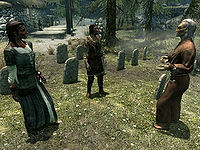 They can initially be found in the Falkreath graveyard mourning their daughter, Lavinia, who was recently killed by Sinding. Despite the hardships that he is currently facing, Mathies still continues to work hard to make sure Corpselight Farm stays running. He starts his day at 6am by heading over to the field behind the Corpselight Farm building. He will then spend the next twelve hours working here, working the land and tending his crops. After working all morning and afternoon, Mathies will leave the farm at 6pm to head to Dead Man's Drink. He will find a seat in the inn and will eat, drink, and socialize with the other patrons. Due to a bug, he will stay here for the next twelve hours until he returns to his farm work at 6am. The only exception to this schedule is when he attends his daughter's last rites ceremony at the Falkreath graveyard which occurs when you first enter Falkreath. He wears a belted tunic and a pair of boots. He is equipped with an iron dagger, and carries a key to the farm as well as a selection of common items and gold. Obviously heartbroken about what has happened to Lavinia, Mathies will not be very talkative when you first approach him, only saying: "A sad time." If you ask him who died, he will begin to tell you about the tragic loss of life: "Our daughter. Our little girl. She hadn't seen her tenth winter." At this point, you can then ask him about who did this or about how Lavinia died. Asking him the first question will cause him to say the name of the killer in disgust: "Sinding. Came through as a laborer. Seemed like a decent man. He's stewing in the pit while we figure out what to do with him, if you've got the stomach to look at him. What could drive a man to do something like this?" If you instead ask him about how she died, he will describe the horrible sight, choking up as he does: "She was... he ripped her apart. Like a sabre cat tears a deer. We barely found enough of her to bury." After he tells you about Sinding, the Ill Met By Moonlight quest will become active. Until you confront Sinding at Bloated Man's Grotto, Mathies may continue to express his confusion about the situation when you end your conversation with him: "I just don't understand what kind of a man does that." After he has told you about his daughter and Sinding, Mathies will become a bit more talkative and will often talk to you about his farm and his wife: "Indara and I like to keep to ourselves and run our farm." and "My wife, Indara, has a gift with animals. It makes her a better farmer than anyone I've ever seen." He may also tell you about how the priest of Arkay Runil has helped him through these hard times: "Runil has been a true friend to my wife and I in our time of need." Mathies may also express his opposition to the civil war: "This war isn't needed. Imperials like my wife can be hard to handle but we Nords could work with them. I should know." and "I don't know if the war is Arkay's will or man's, but it's none of my doings." You can ask him if Falkreath is always so gloomy, causing him to discuss some of his theories on the matter: "Yes, and I couldn't tell you why. My wife and I think there's some dark magic at work. Or perhaps Arkay's influence is strong here, and he likes to keep it this way." If you ask him why the town has such a large cemetery, he will discuss the history of the location: "The cemetery is ancient. It's been here longer than the town. I'm no scholar, but I know that a lot of battles have been fought here over the course of history. After each battle, more dead were buried, and the graveyard got bigger. I've heard it's now the biggest graveyard in Skyrim." He will bid farewell by politely saying: "Good to talk to you." or by providing you with some advice: "You'll meet a lot of tongue-wagging gossips in this town. Try not to take them too seriously." Mathies' wife, Indara, has a lot of respect for her husband and will often talk about him, saying: "My husband Mathias [sic] and I tend Corpselight Farm." and "Mathies is a kind and wise man. The Nords could use more like him. So could the Imperials." Mathies: "The temple is the one place my wife finds peace these days, Runil." Runil: "It is a hard time for all of us. I hope that you too can find some sanctuary here, Mathies." Mathies would have played a role in the unfinished quest, Runil's Dark Past. It was intended for Mathies to go to sleep at midnight. However, his package to stay at Dead Man's Drink has no start time or duration and takes precedence over the sleeping package, causing him to stay at the inn all night. This page was last modified on 10 May 2015, at 19:49.